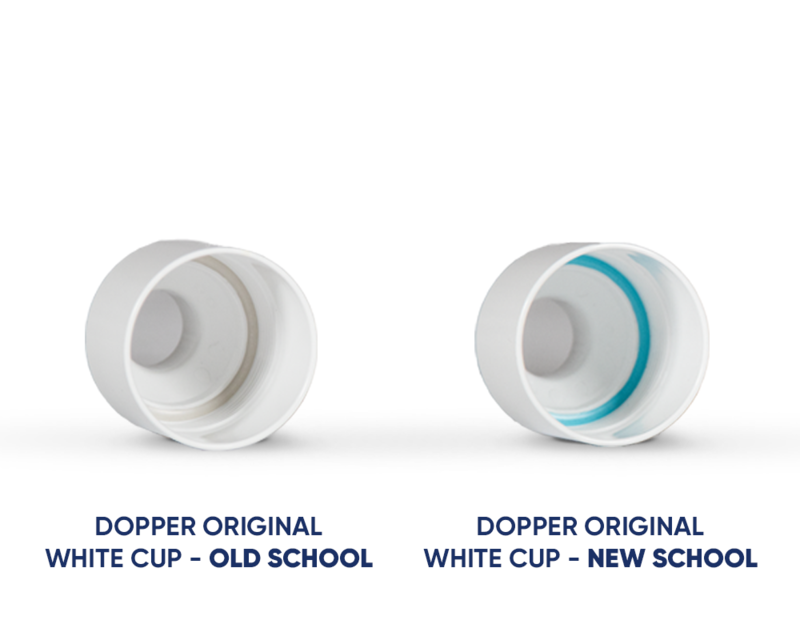 The Dopper is made of PP (the bottle part and the cap) and ABS (the white cup). These materials do not contain harmful substances such as BPA or other toxic plasticisers, making the Dopper less flexible than products that do them. If the Dopper is dropped on a hard surface, or hits a surface at a wrong angle, it may break. You can purchase replacement parts in our web shop. Click here to order a new cup. Replacement parts cannot be purchased at the retail outlets selling our Dopper. But Cupido, check if you have your perfect match. We have two different versions of the Dopper Original. The spare parts of these versions are not interchangeable. You can recognize the Dopper New School on the blue ring in the cup (check it out in the picture below) and the lower screw on the bottle. There's also a little drop on the bottom of the bottle. Still have not found an answer to your question? Any comments you would like to add? Please complete the contact form and we will get in touch with you within a few hours! Is it OK to clean the Doppers in the dishwasher?